Fourteen years ago, White Skull released Public Glory, Secret Agony, an album themed loosely on Rome at the time of Julius Caesar, getting high marks from my colleague Chris. It was during a different phase of the site's existence, so short, snap-judgment reviews were the site's style back then, but I have to agree with him after all this time that that was a special album -- I still listen to it from time to time. Which made it only sadder when, after that album was released, the Italian power metal group lost vocalist Federica de Boni, replaced her with a male singer, and subsequently released a series of forgettable, mediocre albums. However, with 2012's Under This Flag, we see de Boni's return, and a commensurate increase in quality. This isn't quite as good as Public Glory, Secret Agony -- but it's close. Hunted Down starts off quietly, but quickly switches to a swinging tune that is heavy on the chugging. With that, it's like Federica de Boni never left; certainly, her voice doesn't seem to have changed at all. She has a rough snarl on the low notes that reminds one of 80s-era Leather Leone with an Italian accent, but she can turn that on and off effortlessly and replace it with a full, honey-smooth alto, that smoothly moves up to a high scream that rivals a male power metal singer's falsetto. Guitarists Tony Mad and Danilo Bar, on Bottled Mind, are also worthy of note for both the complex riff and excellent solo that pairs perfectly with the melody. We also get Lost Alone, a favorite of mine on the album with a minimalist, fast-paced rock beat on the verse and a razor-edged melodic focus in the same vein as Iron Maiden's The Evil That Men Do. The title track is a mixed bag. The verse is rather unmelodic, but the chorus has a large, symphonic sound with backing vocals that play well with de Boni's tendency to belt out a chorus tune larger than life. The soloing on this one is exquisite, too. A.O.D., however, is an attempt at a power ballad that mostly doesn't deliver, not because of the musicians (all of whom put in a good performance), but because the tune just isn't good enough to carry the song. While I'm on the subject of what sounds good on the album, though, the production has (of course) improved since 2000, and gives equal time to everyone -- the keyboard, bass, and crisp power-metal drumming on Prisoners of War and War After War springs to the ear just as quickly as the guitarist, a nice touch given the obviously guitar-centric nature of the band. The band tends to do the best on short, melodic pieces; Freedom's Not Free and You Choose, with their shouted backing vocals, are snappy and remind one of some of the tracks on Public Glory, Secret Agony. And really, that's what seems to be what the decision was on this album. Redemption, the final track, doesn't disappoint in this regard either; de Boni outdoes herself, leaping suddenly from growls, to whispers, to screams, and she is matched on this one by a melody that is worth the band's considerable musical talent. It seems like White Skull, while not really changing their overall sound, does subtly reorient that sound to fit the vocalist, and in this case they've picked a winner. 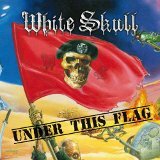 Under This Flag is the best and heaviest album White Skull's done in many years, leaving long-suffering fans of their early work with a good feeling about the future.